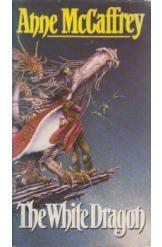 The White Dragon by Anne McCaffrey, Sci Fi. Book is in good condition, all pages intact. Lord Jaxom bonds with the magnificent white dragon Ruth, who has the unique ability to teleport through time as well as space. The two of them launch a new plan to free Pern from Threadfall throughout the entirety of its history, but in the process make a discovery that changes the entire world. Part of the Dragonriders of Pern series.